At The Springs Resort & Spa, we interviewed Joselyn Arroyo, the Director of Groups and Events, who gave us a tour of the resort and its venues for elopements, wedding ceremonies, receptions, and gave us access to a honeymoon suite and a variety of other guest rooms, in addition to its common areas, amenities, activities, and its best views to take photos for the article. 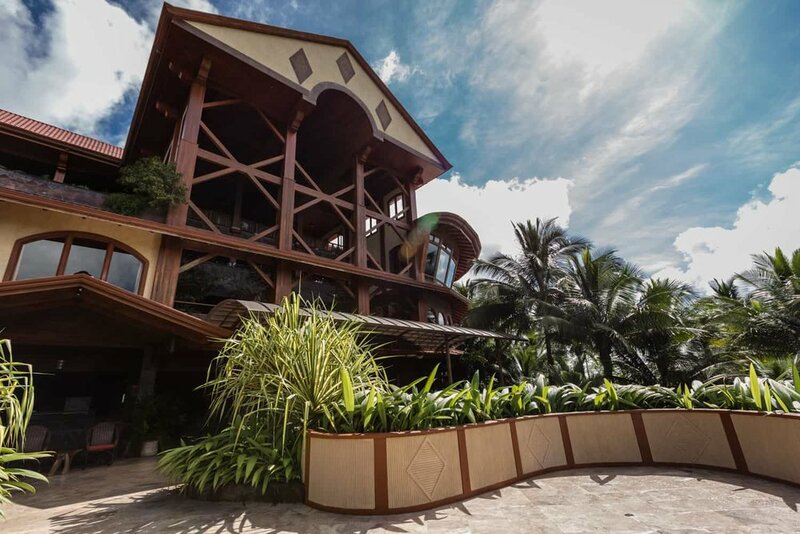 We hope we this article makes finding the right resort for your dream Costa Rica wedding easier. 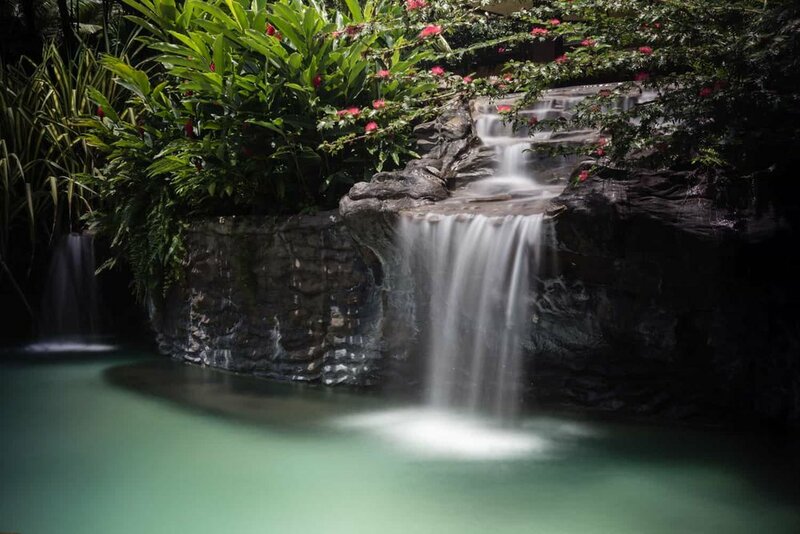 The Springs Resort & Spa is located approximately 3 hours northwest of the Juan Santamaria airport and approximately 2 miles off the main road that passes through La Fortuna. The Springs offers private round-trip transportation to the airport, to local attractions in La Fortuna, and to any other destination in Costa Rica for 1 person or for large groups. 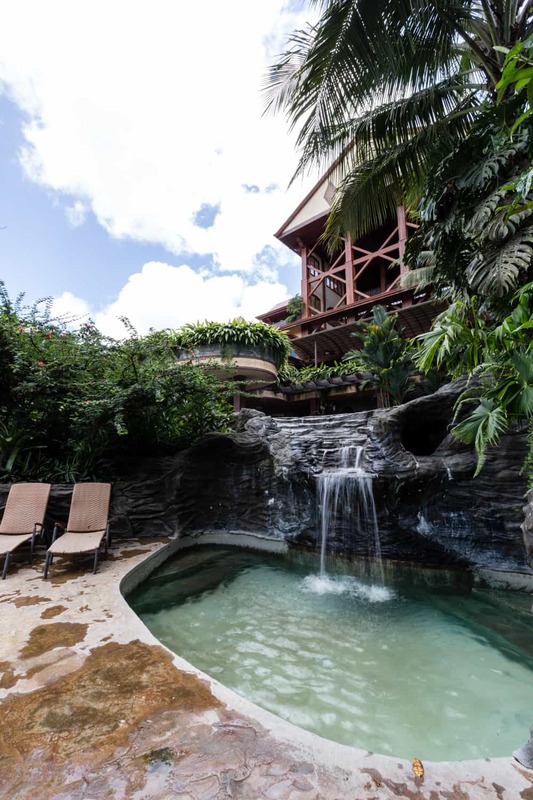 The Springs Resort & Spa is a 5-Star boutique resort situated on 165 acres of rainforest in the mountains surrounding the Arenal Volcano. 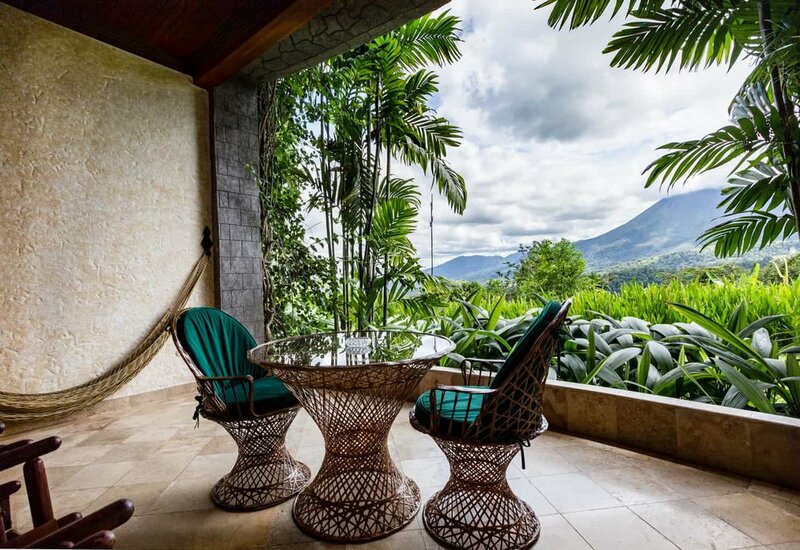 Founded in 2008, the resort’s owner designed it to be integrated into the environment, minimizing its environmental impact and assuring guests a distinct nature experience and amazing views of the jungle and the Arenal Volcano from most anywhere at the resort. 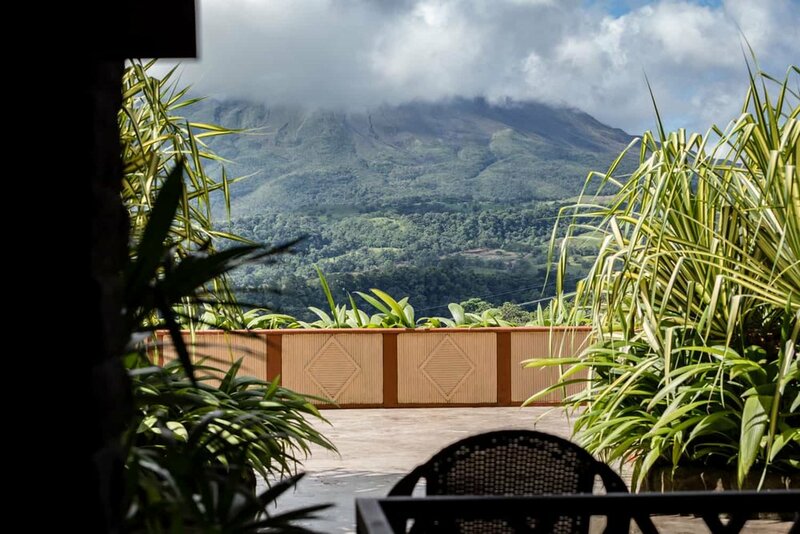 View of Areal Volcano from a bar in The Springs Resort & Spa Reception Building in La Fortuna. What Makes The Springs Resort & Spa Unique? One of the most unique characteristics of The Springs is that it is truly isolated. It is as if you are on a sparsely populated island or at your own secluded, extensive estate, far from the noise and chaos of everyday life. 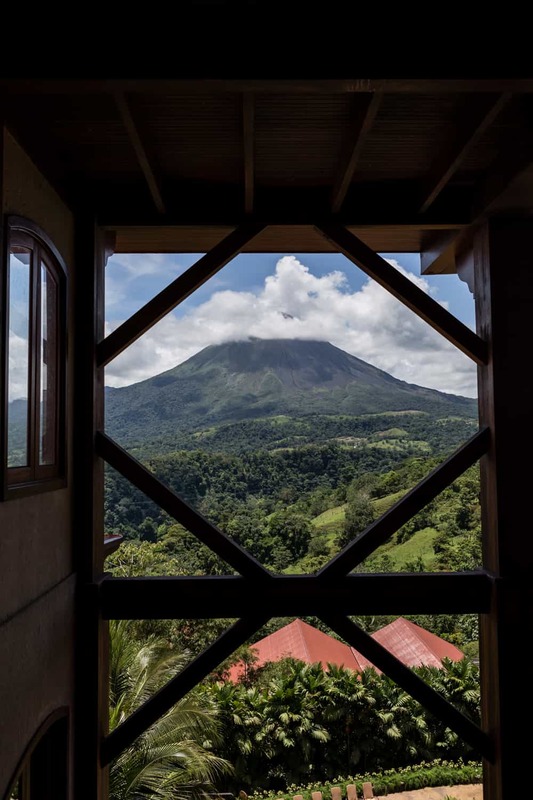 Moreover, the unobstructed views of the Arenal Volcano and rainforest, which can be seen from every guest room and other places, is simply breathtaking. 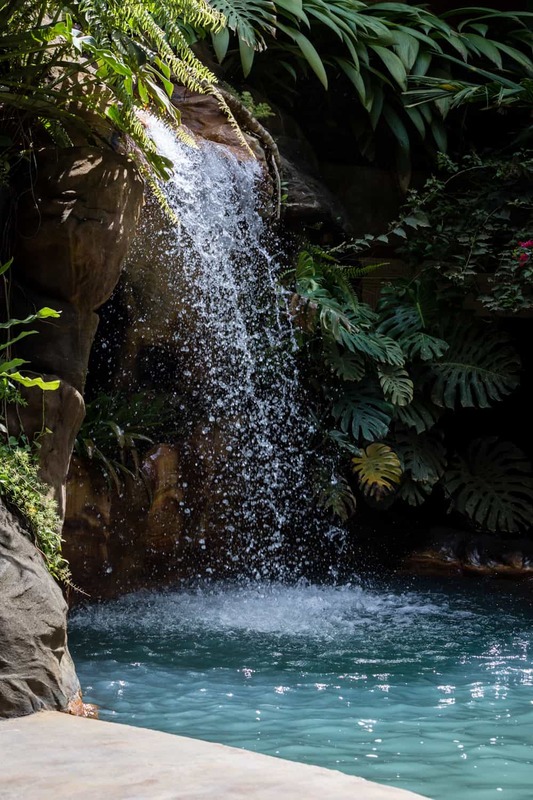 Without its 5-star customer service and various restaurants with diverse and delicious offerings, The Springs would be just another beautiful resort with amazing views. 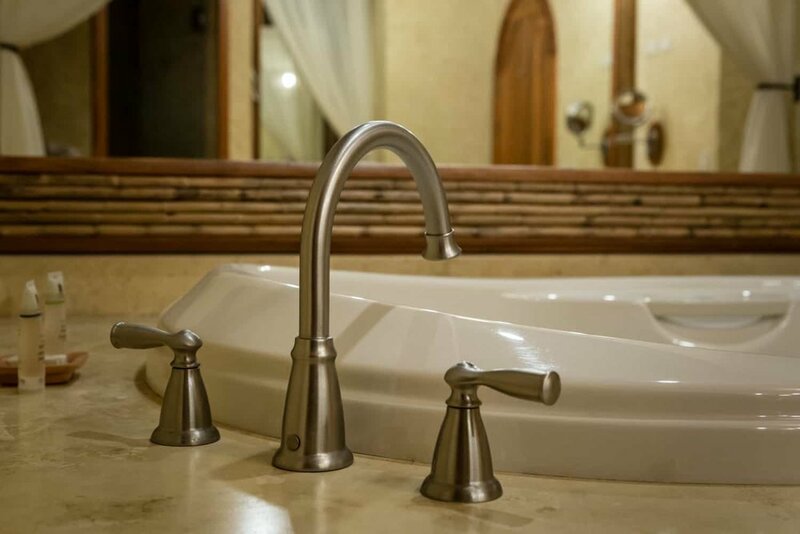 As with its design, every aspect of the guest experience has been taken into consideration. You can rest assured The Springs will tend to your every need regarding your wedding or elopement, and that you will have an amazing and memorable wedding day. There are many things to consider – the climate and weather, the high and slow seasons, for example – when planning a wedding, especially when it is in another country. These factors can affect your experience, the cost of travel, and availability of accommodations. As for the weather in La Fortuna, it is extremely unpredictable. March and April are the only months it is mostly certain to not rain. In the remaining months, especially in December, it is highly probable it will rain on a daily basis. When it rains, it generally does so in the later afternoon into the night. The rain in Costa Rica is similar to that in California – a mild rain lasting many hours, not the severe storms Florida experiences. Not to worry, The Springs has various beautiful covered areas for your elopement or wedding day events that have great views. From mid December to late March is the busy season – the summer –, while the slow season or rainy season – the winter – is from late March to mid December, with the rains intensifying from August to late October. If planning on a wedding in the busy season, make sure to plan far in advance due to high demand for accommodations as the peak season approaches, and expect to pay more for travel and lodging. Costa Ricans traditionally go on vacation in the summer and there are generally more international travelers which compounds the issue. 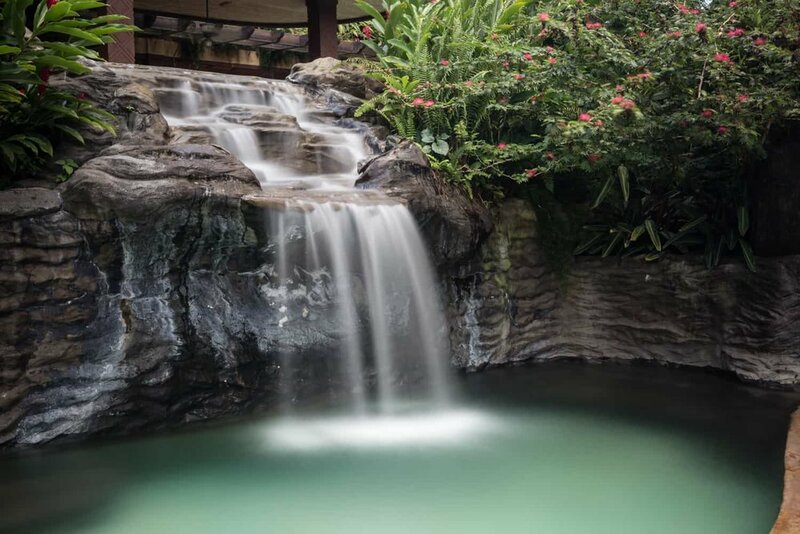 Cascading waterfalls in one of the many thermal pools at The Springs Resort & Spa in Costa Rica. To help plan your destination wedding, Joselyn Arroyo, The Springs Resort & Spa wedding planner, who has been with the resort for 6 years, offers several wedding and elopement packages. She can also provide you with a list of recommended wedding providers – the baker, officiant, photographer, videographer, and entertainment – whom you can contract directly. Their florist, however, is onsite, and will work with you to design the floral arrangements and wedding bouquet of your dreams. Whatever your wedding day needs may be, Ms. Arroyo and her team will ensure they exceed your expectations. On your wedding day, you need not leave your room for anyting. You can have your hair styled, makeup applied, and your manicure and pedicure all done at the resort, in your room in fact. Need a photographer for your dream wedding? We'd love to be your photographers! 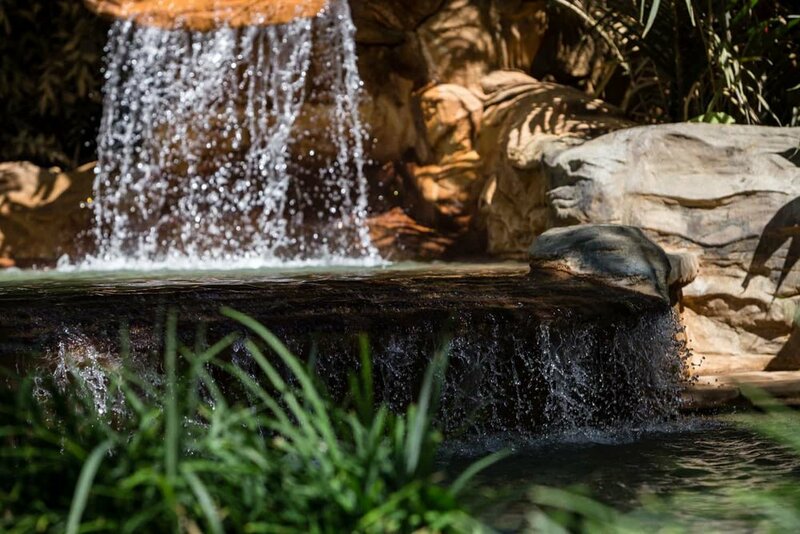 The Springs can manage up to 4 elopements or smaller weddings per day, or up to 2 larger weddings per day depending on the schedule of each event. The resort accommodates many types and wedding events, from elopements and intimate weddings to weddings up to 120 guests, and from traditional weddings from any culture to non-traditional weddings and civil ceremonies. According to Ms. Arroyo, when it comes to your weddings, her only concern is your happiness and comfort. 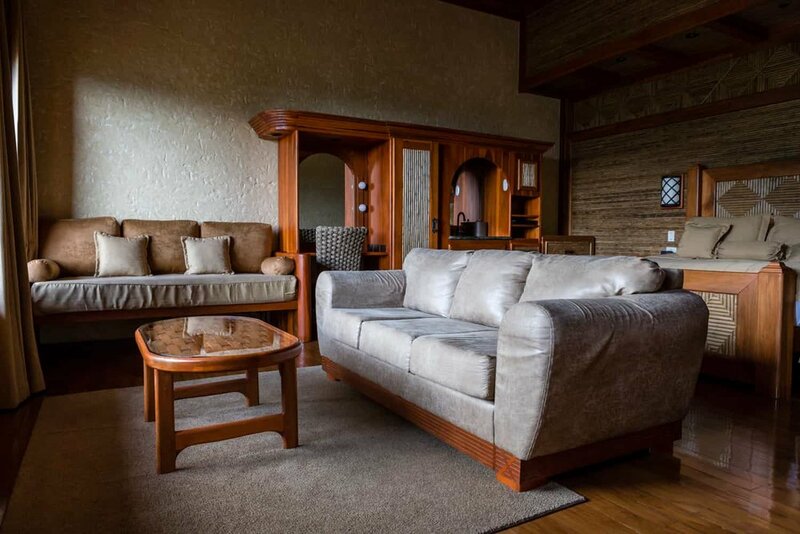 The resort can accommodate all the lodging needs of you and your wedding guests with their wide variety of rooms. 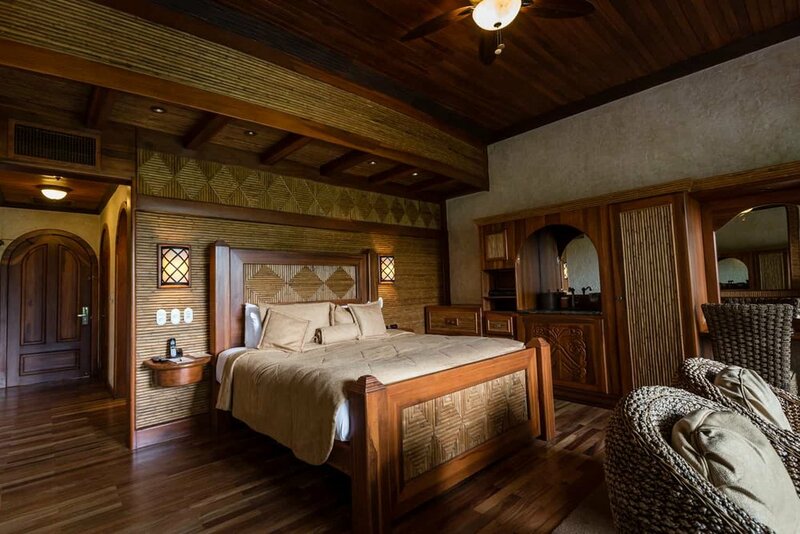 There are the Vista Guest Room and Alta Vista Guest Room, which are considered their basic accommodations, the Honeymoon Vista for your wedding night, two-bedroom suites, a penthouse, a stand-alone house – The Falcon’s Nest – and the Presidential Villa. 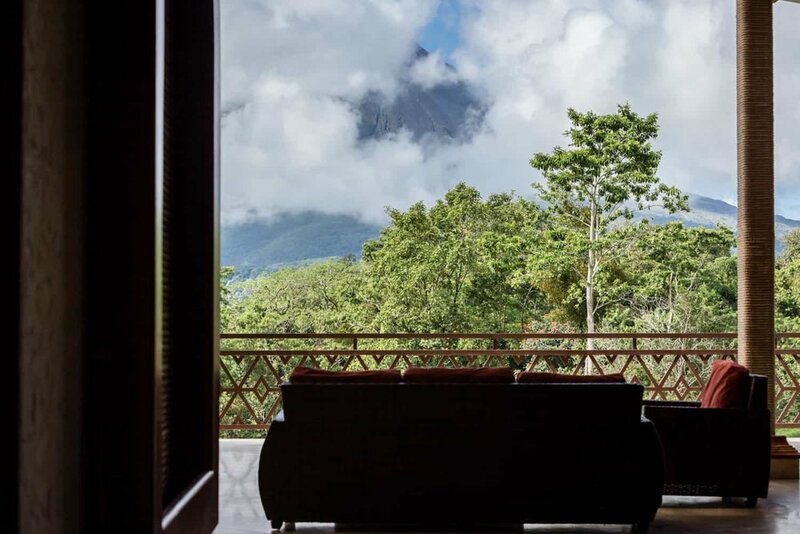 All rooms are equipped with air-conditioning and have stunning views of the Arenal Volcano and surrounding rainforest. 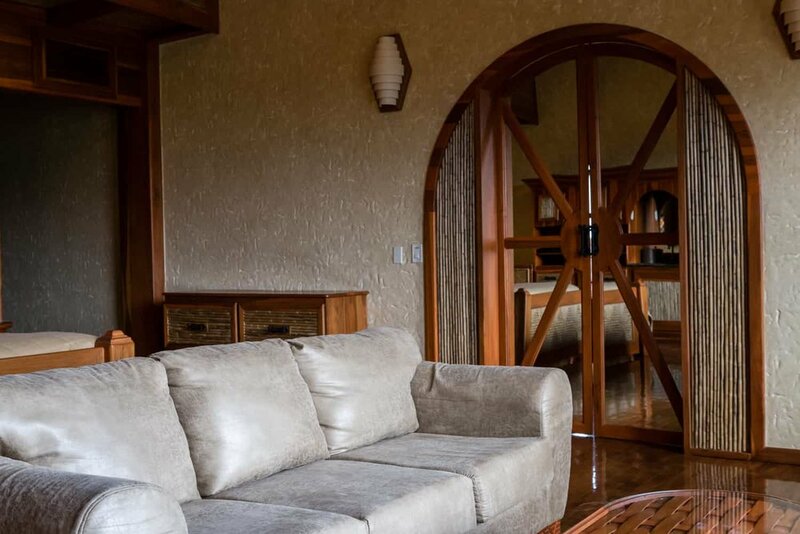 Moreover, they are very spacious due to high ceilings and large windows facing the volcano, and the extensive use of solid wood for the floors, doors, and furniture gives them a warm, homey feel. 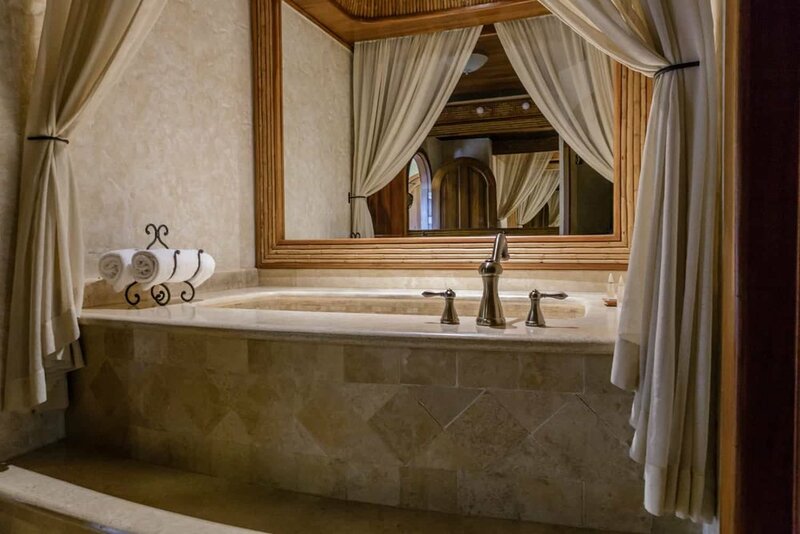 The bathrooms are more than ample, having a two-sink vanity and enormous mirror, a natural stone walk-in shower, a separate toilet room, and a Jacuzzi-type tub for you to relax before and after your wedding. 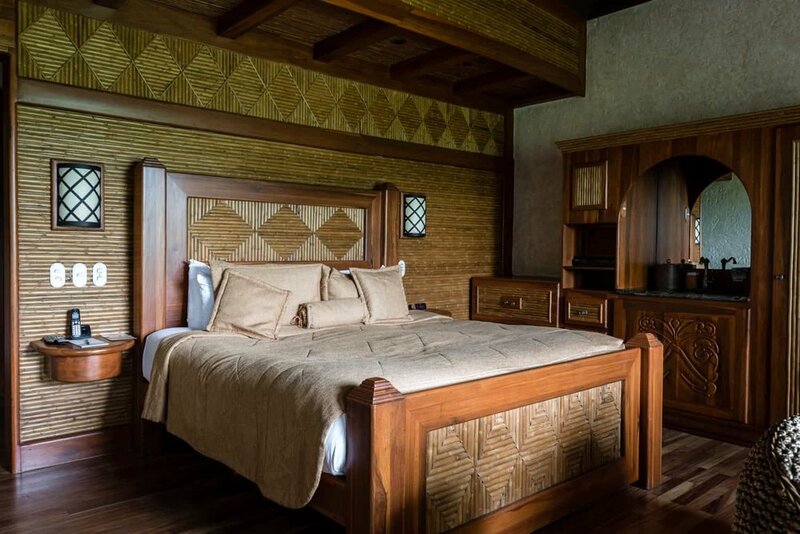 Whether in a Vista Guest Room of the Presidential Villa, all accommodations share a similar style and design with regards the furniture, fabrics, colors, and finishings, all of which are rustically elegant and high quality. The primary differences between the rooms is the total size, floor plan, and amenities, with some having more rooms, a balcony or terrace, or outside hot tub. 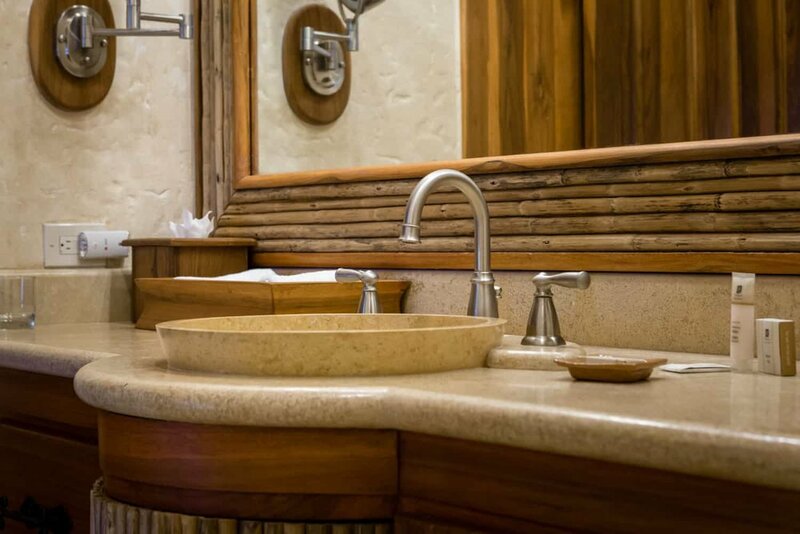 The Honeymoon Vista, The Springs Resort & Spa’s honeymoon suite, is the same size and design as the Vista Guest Room. 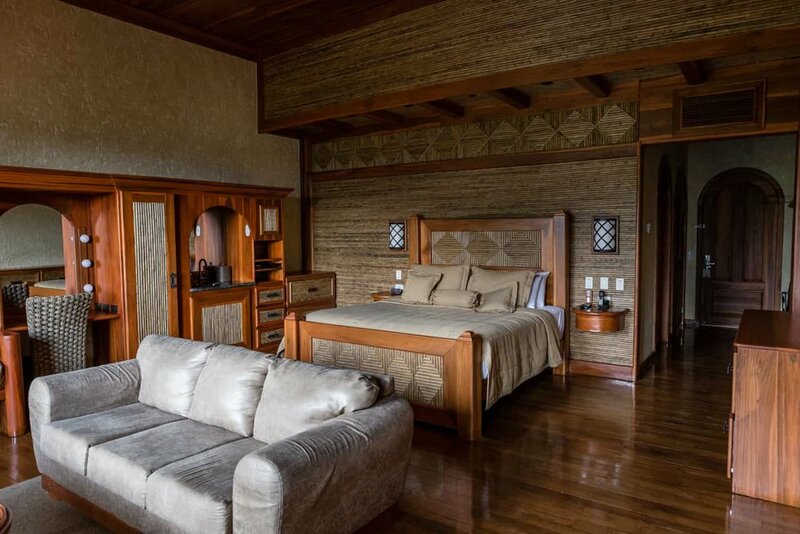 It is a large room that is finished exquisitely with one main difference: it has either a volcanic stone hot tub on the terrace that is fed by a thermal spring or a Jacuzzi-type hot tub that has standard hot water. 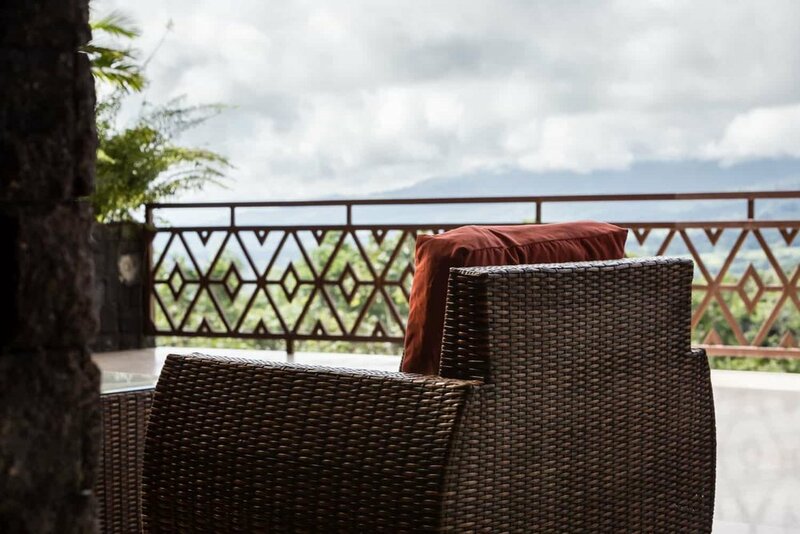 From the terrace of either room, the view of the Arenal Volcano is spectacular. The guest room is the same as the Vista Guest Room but is located on the second floor. The Penthouse has the same design and furnishings with respect to the bathroom and bedroom and living area as the other rooms we photographed, but does not have a balcony. It has an additional room with a dining table, chairs, and the wood cabinet that almost covers an entire wall that includes a bar that is found near the bed in the other rooms, and an additional bedroom containing two twin beds and a reduced bathroom with a walk-in shower. 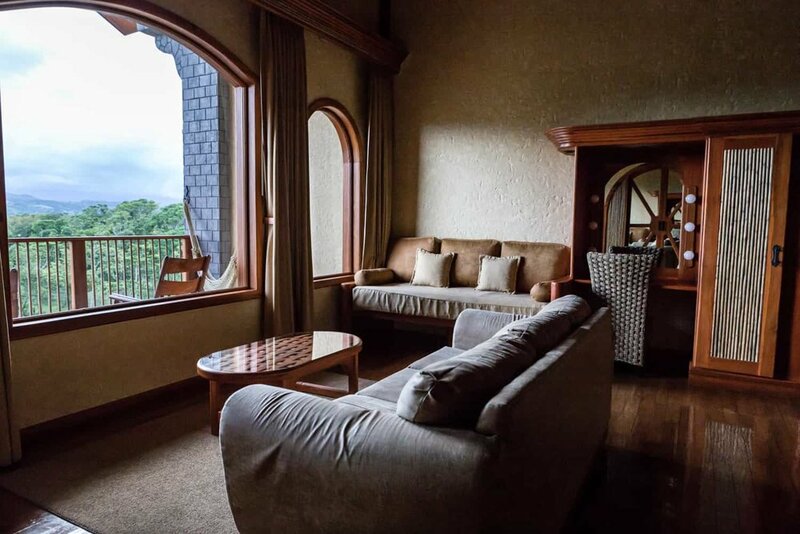 There is a marvelous view of the Arenal Volcano from the windows in the main room and some of the windows in the dining room. The following is a detailed list of their wedding venues that includes which functions it can accommodate and the maximum number of guests each can accommodate, along with photos when available. * The capacity of each location will vary if there is a DJ, live music, or other form of entertainment or service. Sunset Terrace is an open-air site that is ideal for intimate wedding ceremonies and elopements with a maximum of 24 guests. 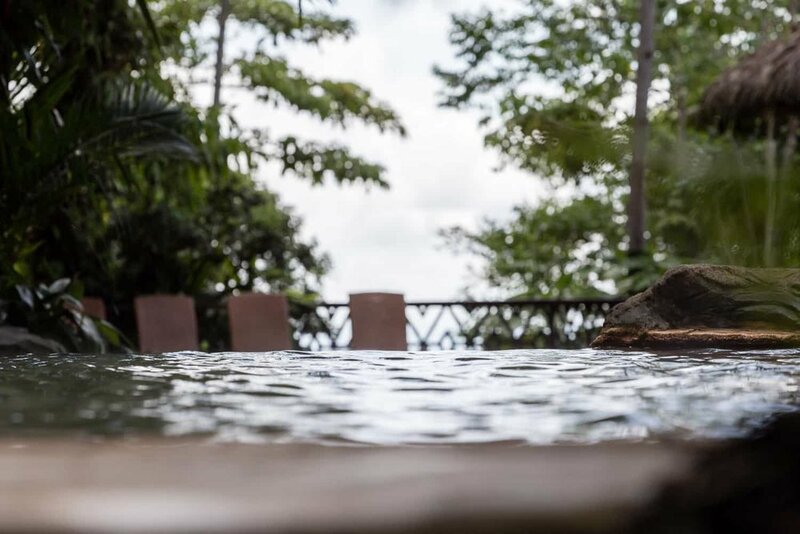 It is located at the Reception Building one level above the Pool Level and has an amazing view the Arenal Volcano and the surrounding rainforests. 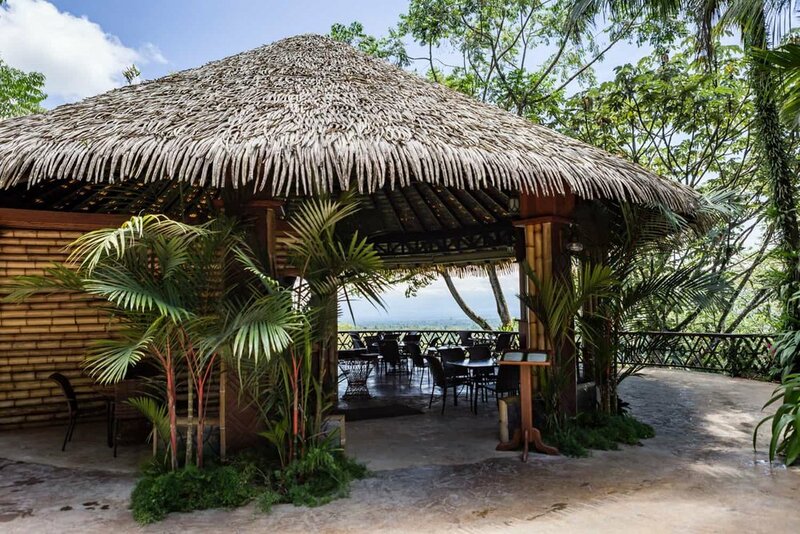 The Aracari Terrace is another stunning site for ceremonies, receptions, and dinners of 100 guests or fewer. 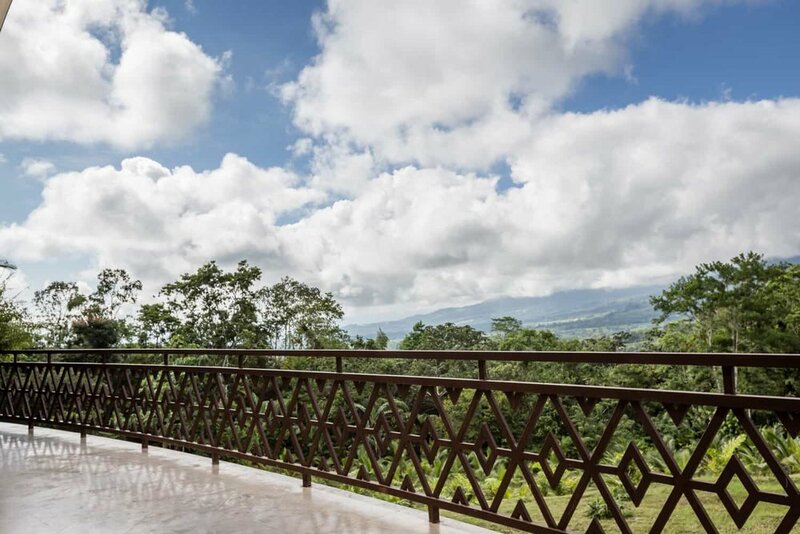 It is located on the bottom floor of the Aracari Building and has a expansive terrace at one end that overlooks the Arenal Volcano and rainforest, which will make for a great backdrop for your wedding photos. Treetops has a combination of covered and open-air areas and can accommodate weddings receptions and dinners with up to 100 guests, 40 people in the covered area and 60 in the open-air section. 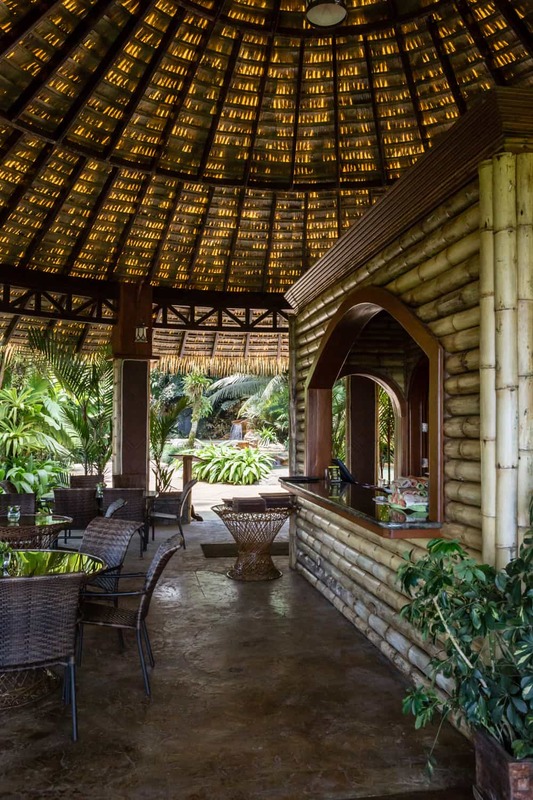 It is located at the Pool Level at the Reception Building and has a casual island-Caribbean vibe due to the large elegant hut that serves as its covered area which is surrounded by an open area bordering thermal pools. 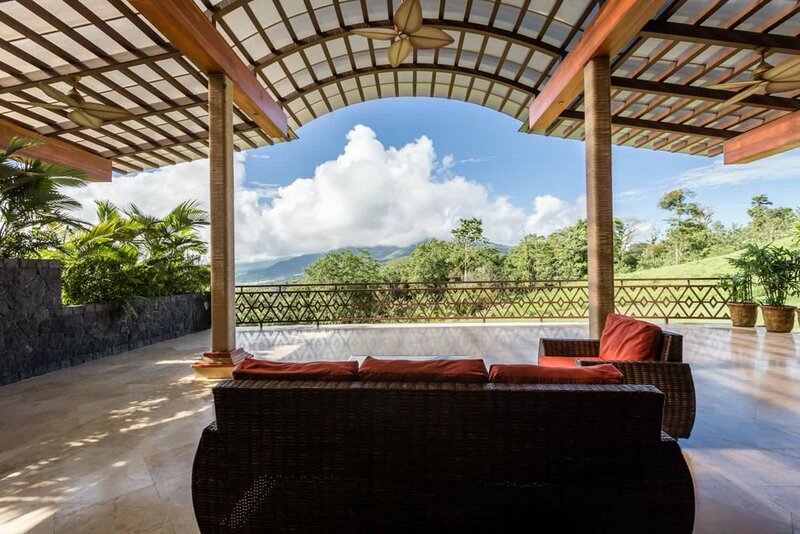 As with the other sites, it has a great view of the Arenal Volcano and rainforest. Similar to Treetops, Ranchito Bar & Terrace has open-air and covered spaces that is great for weddings receptions and dinners with a maximum of 48 guests, 16 in the covered location and 32 in the open-air area. 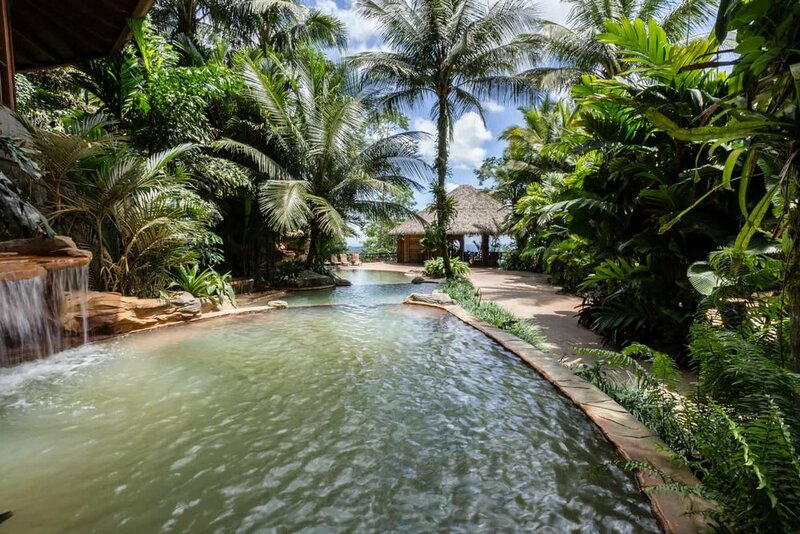 It is located at the other end of the Pool Level and has the same ambiance as Treetops with a smaller hut. Its open-air area borders thermal pools and shares the same amazing view of the Arenal Volcano. * Due to circumstances beyond our control, we were not able to photograph the following locations. We did, however, collect pertinent information to help you decide on a wedding at The Springs Resort & Spa. Rancho Club Río & Lawn has an open-air section and covered area that can accommodate wedding ceremonies, receptions, and dinner of up to 420 people, 120 in the covered area and 300 on the lawn. It consists of a 2,375 sq. ft. rectangular covered area whose style is similar to that of the hut at Treetops and El Ranchito and a 5,000 sq. ft. uncovered lawn. It is located approximately one mile from the Reception Building next to a river. Unfortunately, shortly after arriving at this location, it began raining and we were unable to take photos. Pillar’s Ballroom is an indoor venue s suitable for wedding receptions and dinners consisting of no more than 80 guests. It measures 44’ X 51’ and has a total of 2,315 sq. ft. It is located on the Conference Level in the Reception Building. 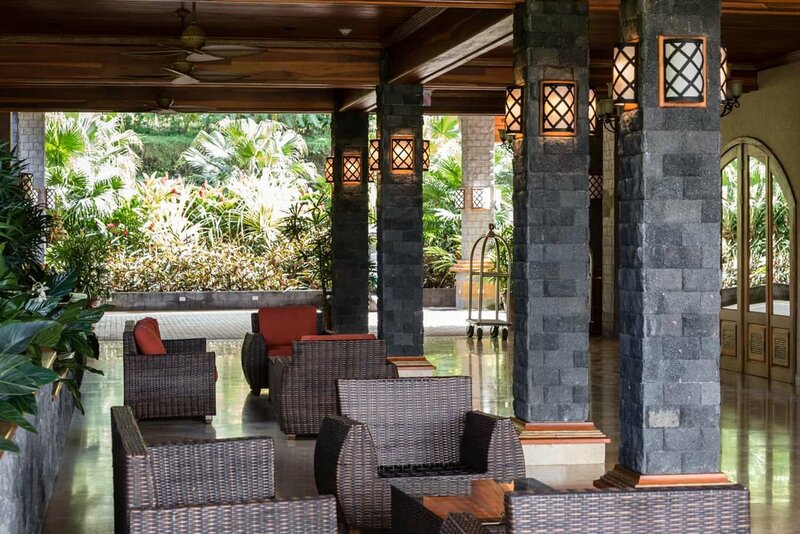 The Pillar’s Terrace has an indoor and open-air area on its terrace and is capable of accommodating up to 88 of your guest for a wedding reception or dinner. Measuring 77’ X 26’ for a total of 2,494 sq. ft., it is located on the Conference Level in the Reception Building and has great views of the Arenal Volcano from its terrace. Base of the beautiful staircase in the Reception Building is a great place for elegant wedding portraits. Tres Casacadas (Three Waterfalls) is a covered and open-air location for a wedding dinner that can manage a total of 144 guests, 108 in the covered section and 36 in the open-air area. 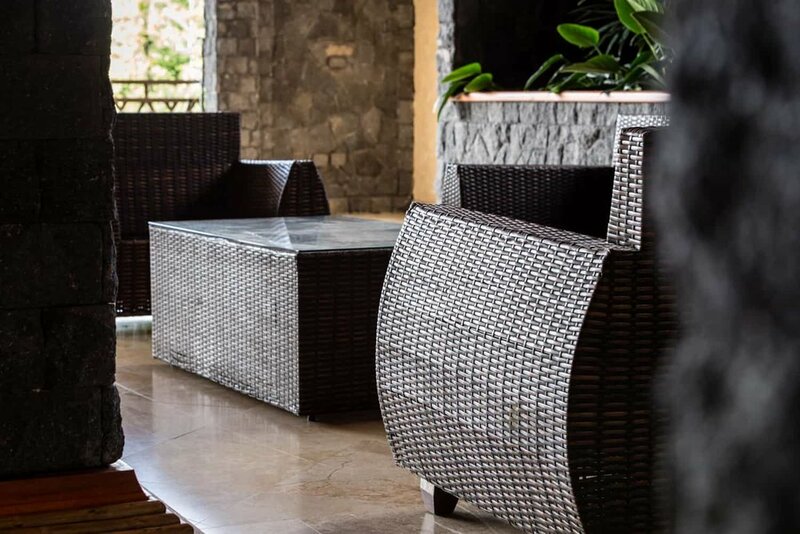 It is located in the reception building on the same level as Las Ventanas and is a more casual dining environment that has an amazing view of the Arenal Volcano from its terrace. The Fountain gallery is an additional covered location that accommodates up to 56 people where you can have the reception and dinner. 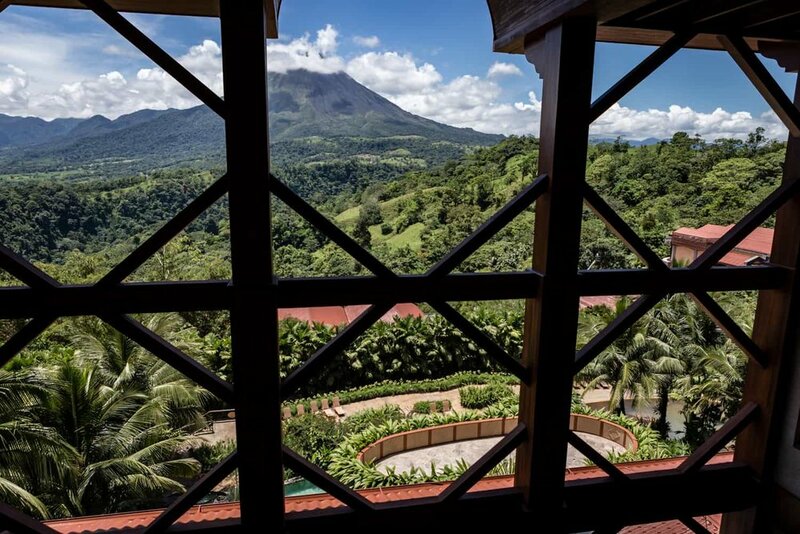 It is located on the conference level in the Reception Building and has views of the Arenal Volcano from one side of the venue. 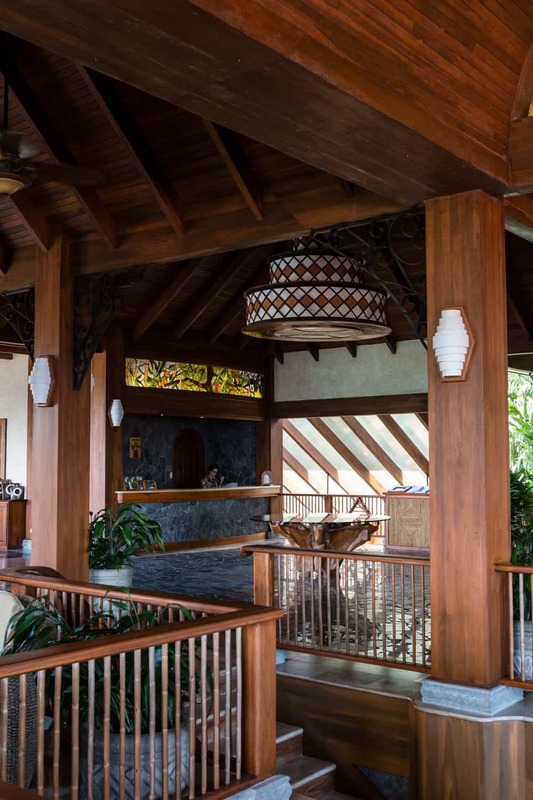 Las Ventanas (Windows), is a more formal dining area located indoors that is ideal for a wedding reception and diner with a maximum of 170 guests. 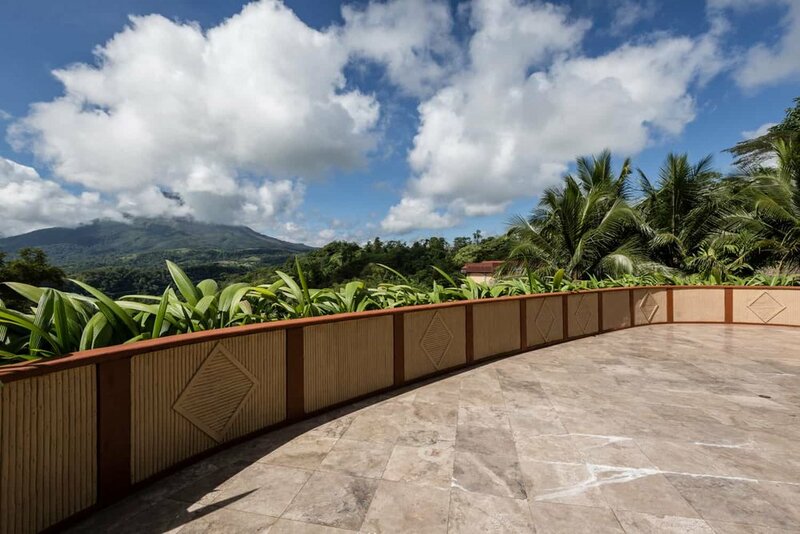 Located at one extreme of the Reception building, its outward-facing walls consist of enormous windows, giving you and your wedding guests an unprecedented view of the Arenal Volcano and rainforest, especially at sunset. 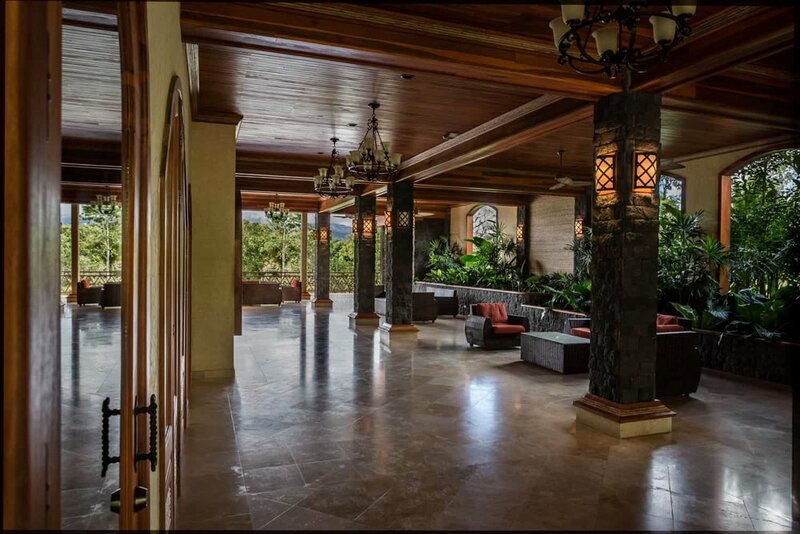 Note: Las Ventanas is the only restaurant at The Spring Resort & Spa that has air-conditioning. Is the Springs Resort your ideal wedding Venue? Start planning your Costa Rica Dream Wedding Today! 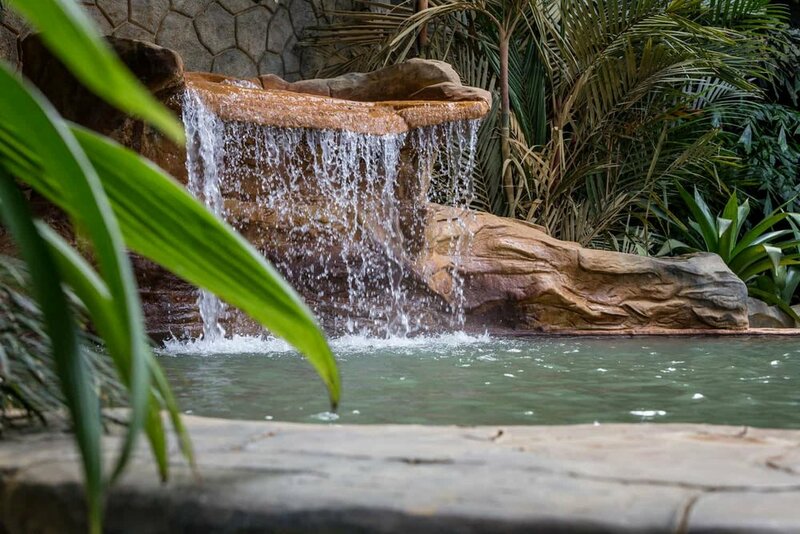 There are many natural attractions and wonders and activities to take in before and after your wedding at The Springs Resort & Spa and in La Fortuna. 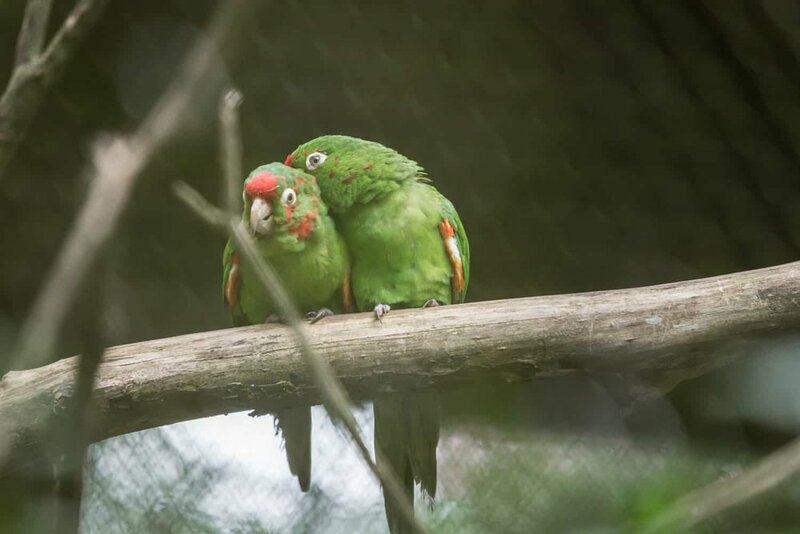 From thermal springs to hanging bridges, to nature hikes to wildlife refuges, from views of the Arenal Volcano to the La Fortuna Waterfall, there is plenty to see and do at the resort and in La Fortuna. 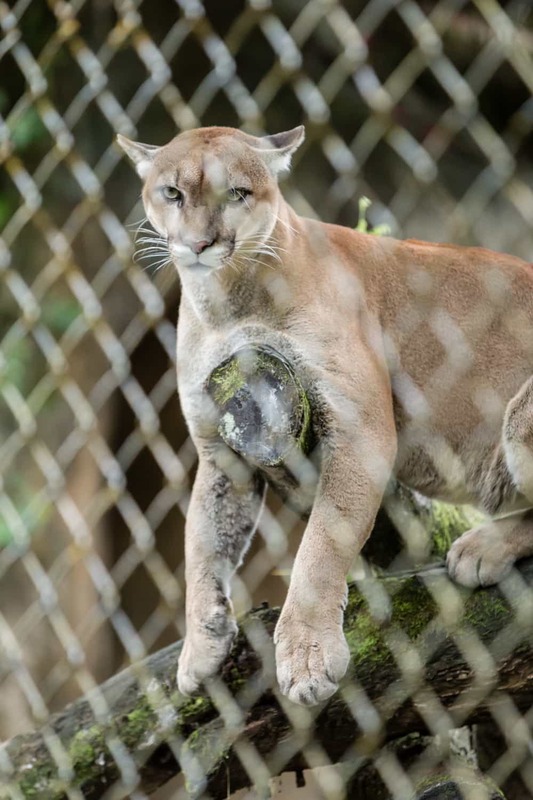 The wildlife sanctuary and outdoor center are located about one mile from the center of the resort along the Arenal River. 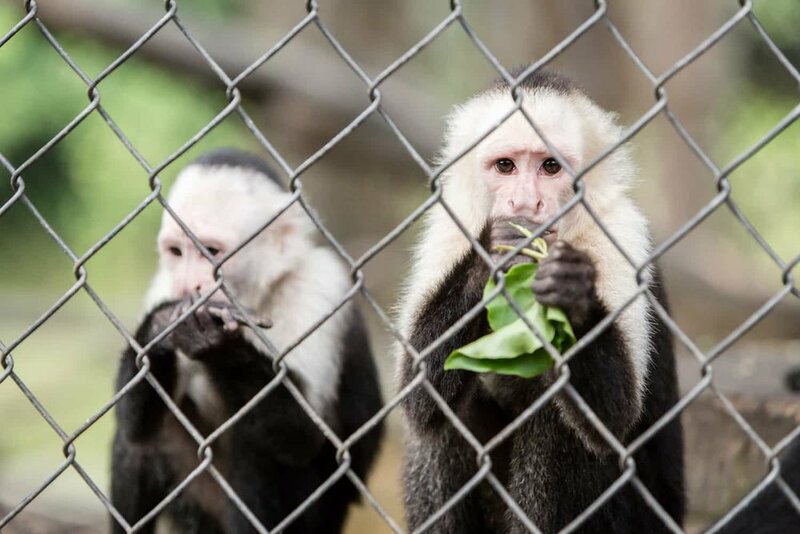 The wildlife sanctuary is home to animals native to Costa Rica that have been either been confiscated from poachers or from citizens who possessed them illegally, or were donated by other similar private animal preserves or individuals. 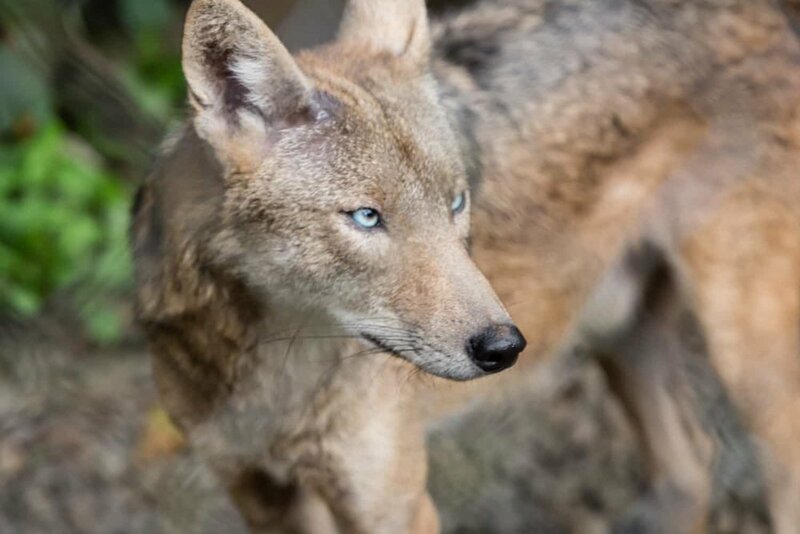 Here you will find wildcats, a coyote, crocodiles, birds, a sloth, and other animals. 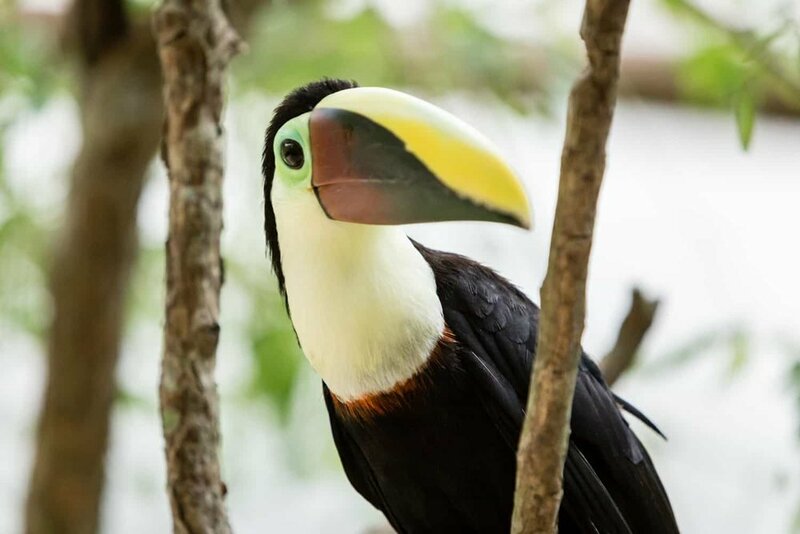 At Club Rio Outdoor Center, you can go kayaking in the Arenal River on an inflatable kayak or river tubing, as well as tour the area on horseback or climb a rock wall or go rappelling. You can also go on hike on several trails, take a nature tour, see the natural hot springs, go mountain biking, fishing or swimming. 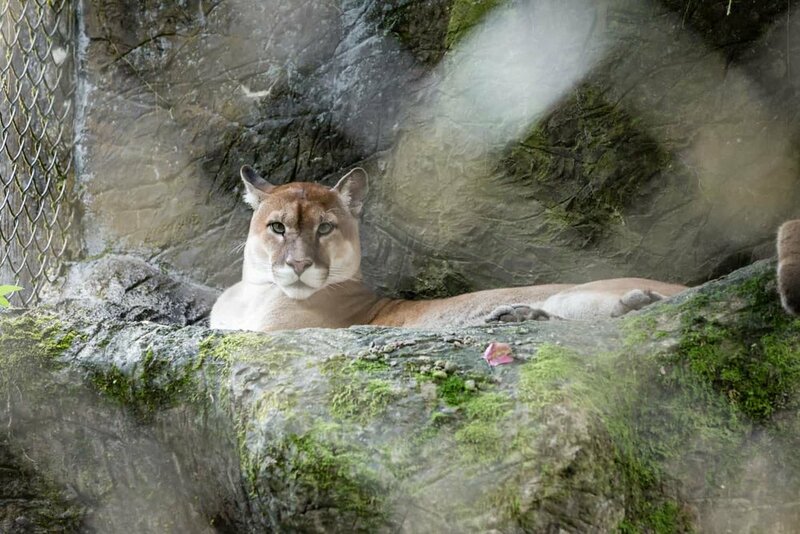 These are a few of the photos we managed to take of animals in the sanctuary before it started to rain. 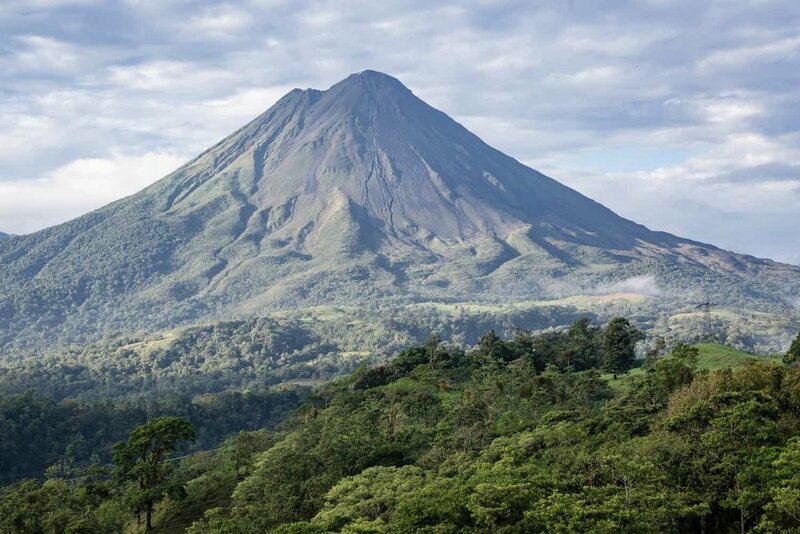 If you are interested in hiking to the volcano, visiting the La Fortuna Waterfall, zip lining, rappelling, walking on hanging brides, horseback riding, coffee and cocoa (chocolate) tours, and riding an ATV among other activities and attractions, they are available off site. The resort is more than happy to organize excursions and activities through their local tour guide operator. Long exposure photo of river flowing over rocks with base of La Fortuna Waterfall in Background. 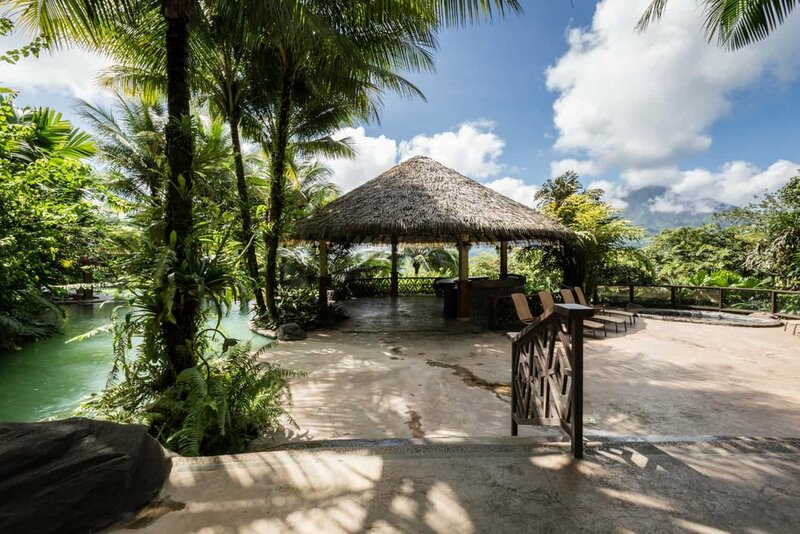 In their luxurious, expansive, full-service spa, you can treat yourself to a body wrap, a facial, a massage, and then a manicure and a pedicure, followed by relaxing in a private relaxation areas for ladies or men only, all while enjoying a spectacular view of the Arenal Volcano. The Springs has a spacious fitness center where you will find an extensive assortment of modern resistance training and cardiovascular machines that are clean and well maintained that will satisfy all of your fitness needs. 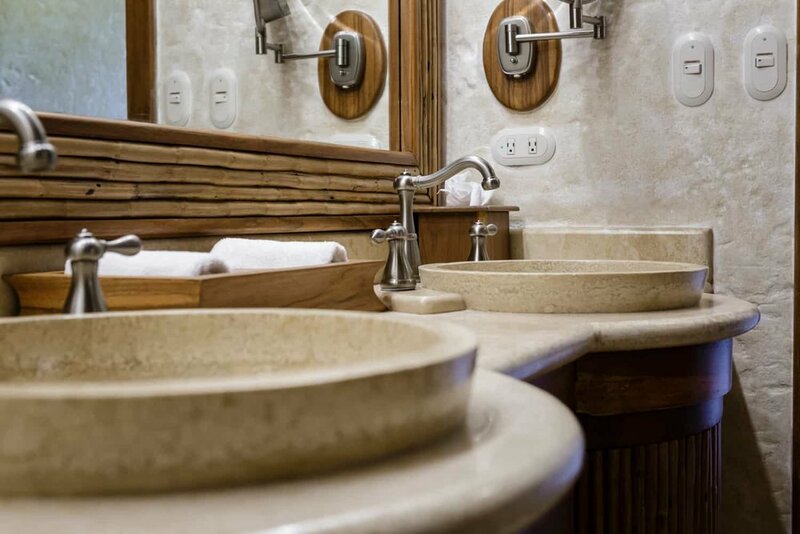 After your workout, you can take advantage of their steam room and sauna, and private showers and changing rooms. 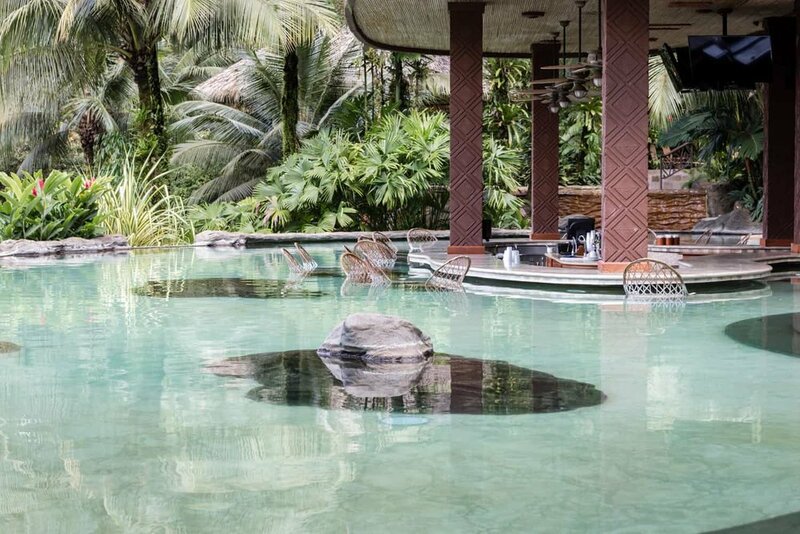 Relax in one of their many natural thermal springs, from the various thermal spring-fed pools located by the reception building, or the thermal pools connected by cascading waterfalls under the canopy of the nearby rainforest for a more private experience surrounded by nature. Views - waterfalls, volcano, Submerged bar . . . There is no shortage of amazing views at The Springs Resort & Spa. 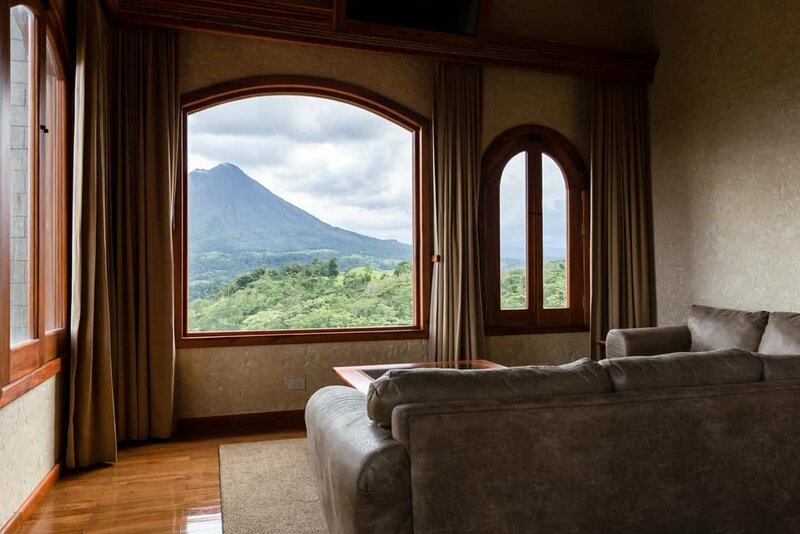 Every room, from honeymoon suites, to standard rooms, to penthouses to the Presidential suite, has an amazing view of the Arenal Volcano. It’s just that some better than others. 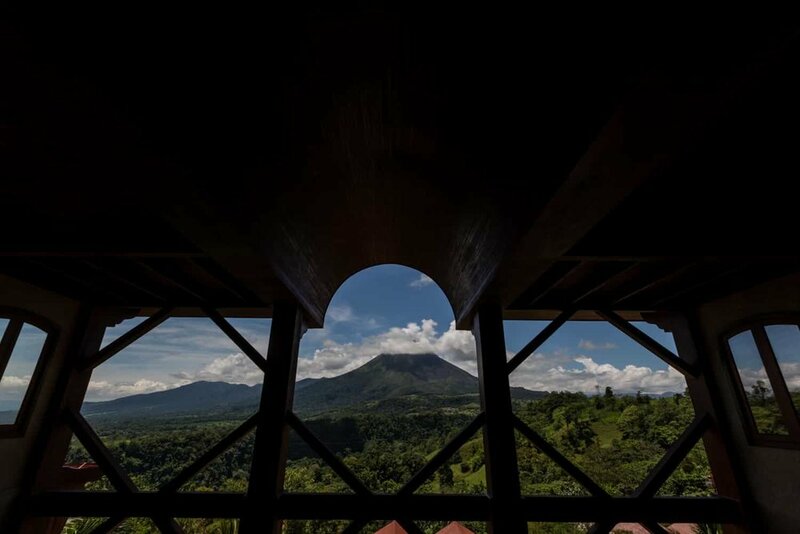 Many other buildings and sites have a terrific view of the volcano – the thermal pools, reception, the spa, the restaurants, and even the paths – not to mention the surrounding hills and mountains that are covered in a dense, tropical rainforest. The spacious accommodations are warm and rustically elegant. Each has wood ceilings, furniture and floors, and warm synthetic lighting and copious amounts of natural light. 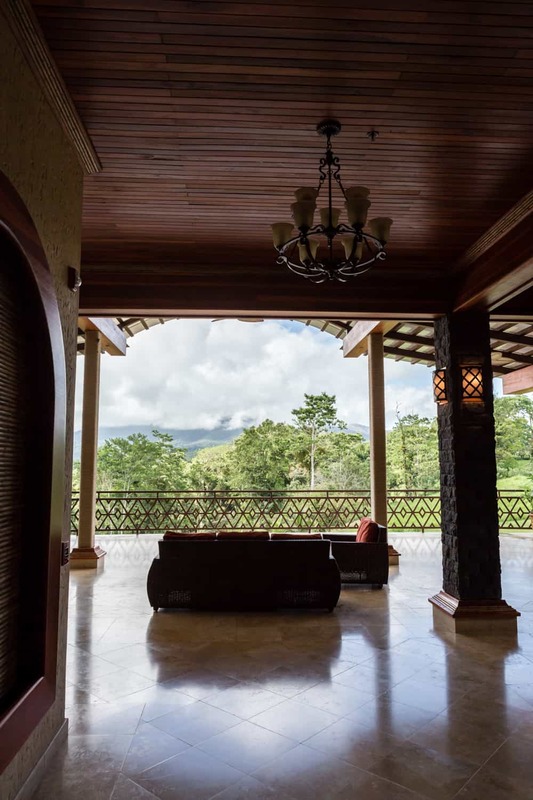 The large windows, walkways, and doors, in addition to the high ceilings give a sense of expansive openness, especially when the curtains are drawn, exposing brilliant views of wide-open countryside with the towering Arenal Volcano not far off in the distance. The resort and its surrounding are simply amazing and serene. 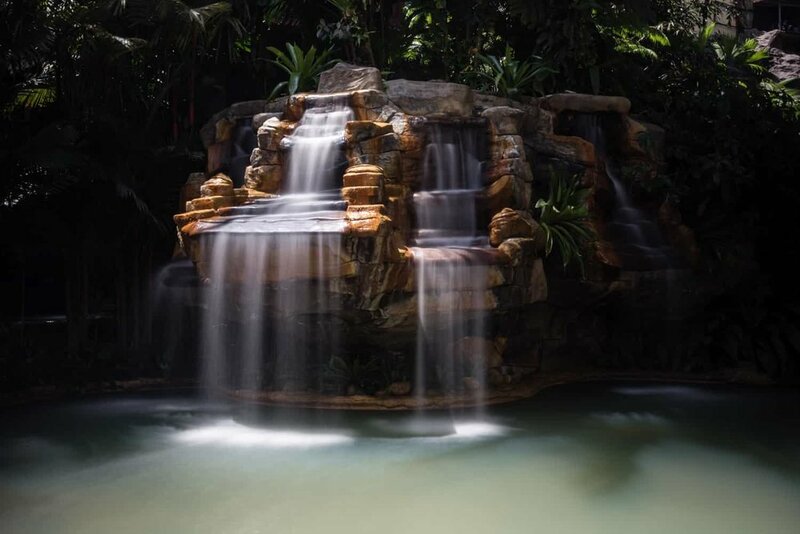 Spending time in one of its thermal pools at night, especially the one hidden in the rainforest, is a treat. Its isolation is one of its greatest features, given that it contributes enormously to is overall feel.